Our company holds expertise in offering Raktashodhini Tablets that are procured from the reliable sources. 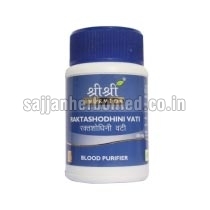 Raktashodhini Tablets purify the blood and flush the toxins that have been long accumulated in the body and blood stream. Their active ingredients help in treating skin and blood related diseases. These tablets are widely known for high efficacy and causing no side effects. We are capable of catering to the bulk requirements of Raktashodhini Tablets with utmost ease. Ingredients : Nimba, Krishna Shariva, Haridra, Katukarohini, Manjishta, Khadira sara, Ushira, Rakta chandana, Vidanga, Aragvadha, Bakuchi. Indications : It helps to treat Hyperpigmentation, Acne vulgaris, Itching and Impurities in Blood. Dosage : Two Tablets twice daily after meals.